From left: Bruce Allen, president of Petroleum at Canadian Tire; Wayne Carson, president of Kilmer Infrastructure Developments Inc.; Ken Tanenbaum, chairman of ONroute and vice-chairman of Kilmer Van Nostrand Co. Ltd; Neil Thompson, vice-president America Northeast and Canada at HMSHost; Amy Dunne, vice-president of Business Development at HMSHost. INNISFIL, Ont., — The opening of the Innisfil, Ont. ONroute on June 15 marked the completion of a five-year project to overhaul the service centres on highways 400 and 401. 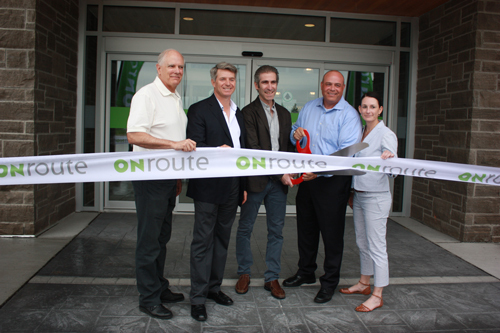 The 20th and last new build, the Innisfil ONroute replaces the Cookstown, Ont., location on southbound Highway 400. It features Tim Horton’s, New York Fries, Starbucks, Burger King and M Market. Host Kilmer Service Centres (HKSC), a joint partnership between HMSHost and Kilmer Van Nostrand Co. Limited, celebrated the completion of the project on June 14 with a preview and trial run. New to the Market concept, which offers grab-and-go options and travel necessities, is a hot food counter with sandwiches, pizza flatbreads and salads designed by HMSHost executive chef John Pekka-Woods. Dunne said it’s important to provide portable, fresh, healthy options and be on trend, adding the market additions are reminiscent of HMSHost’s airport concepts. She noted that if the hot food offerings are successful in the Innisfil location, HMSHost might extend them to other high-traffic centres, but might alter the menu depending on the other foodservice options. “You don’t want to compete with yourself too much,” said Dunne. The Innisfil centre has a similar design to the other 19 ONroute locations, which vary in size depending on area and traffic. “I think we really saved our best work for last,” said Kilmer Developments president Wayne Carson. Combined, the ONroute system services more than 35 million customers a year. “It’s been quite a journey,” said Bruce Allen, president of Canadian Tire Petroleum, which was chosen as the fuel partner for the centres. He said he remembers scrambling to open seven before Canada Day in 2010. Host Kilmer chair Ken Tanenbaum describes the buildings as “light, bright and airy” as well as “timeless.” The service centres are designed for 50 years of continual use and are built to Leadership in Energy and Environment Design (LEED) specifications — 16 are LEED silver certified and three are LEED gold. The Innisfil locations was designed to be LEED silver. Common design elements include natural stone, a wood trellis, natural light from ground-to-roof windows, and an upward sloping roof, which Tanenbaum said is reminiscent of peaked rocks of the Canadian Shield. The private-public partnership began with a redevelopment program set in motion by the then McGuinty Liberal government. When phase one was completed in 2010, Premier Kathleen Wynn was the Ontario minister of transportation. Three other service centres (Newcastle, Maple and Ingersoll, Ont.) — which saw updates in the 1990s — are slated for renovations in 2025.